Spending 1 day to explore Phnom Penh, a unique bustling city. A visit to the Royal Palace and Silver Pagoda which remains home to the Royal family is part of your time in this bustling city as well as the inspirational Wat Phnom temple complex. Upon arrival at Phnom Penh International Airport meet our guide and driver then transfer Phnom Penh city tour: Visit the Victory Monument and the National Museum, also called Musee des Beaux-Arts. A French archaeologist and painter, Georges Groslier, designed it in Khmer style in 1917. 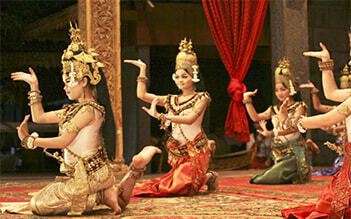 The museum contains a collection of Khmer artnotably sculptures-from throughout the ages. Have lunch at the local restaurant. Visit the Royal Palace, built by the French in 1866 on the site of the old town, and the Silver Pagoda. Located within the grounds of the Royal Palace, the Silver Pagoda is so named because of the floor, which is made up of 5,000 silver tiles. The treasures found inside include a solid gold Buddha, encrusted and weighing 90 kilograms and small 17th century emerald and baccarat crystal Buddha. End your afternoon with a visit to Wat Phnom Temple, Phnom Penh’s namesake, from where you can enjoy views over the tree-lined avenues of the city during sunset. Transfer to Phnom Penh International Airport for the next destination. Incredible driver, punctual, great knowledge about locations, patient, flexible, knows his way extremely well, friendly persona, helpful and caring, all adding up to make him an amazing and awesome guide and driver! Impressive day trip Excellent guide and a very imressive day trip. Very well organised and a good insight of the past and present. Absolutely harrowing experience that I recommend to anyone visiting Phnom Penh. Our guide was very sweet and knowledgeable. It was heartbreaking hearing her childhood stories and having to experience what she does every day living with the past of the Cambodian Genocide. She gave a lot of helpful information in the bus rides and during the tour. As a solo traveler, it was great to be in a small group, and make a few friends during the tour. I would recommend this tour but be prepared for the history of this situation. The pictures and the sights depict the actual history. The guide was extremely knowledgeable and professional and was sensitive to the travelers and the history of this tour.